With junior outside hitter Yun Yi Zhang battling an ankle injury and playing a reduced role, junior middle back Jessica Antosz responded with a game-high 14 kills to help the Owls beat Rhode Island, 3-1. JAZMYNE ANDERSON TTN Junior middle back Jessica Antosz goes up for a block in Friday’s game against Fordham. The Owls beat the Rams, 3-2, and then defeated Rhode Island Sunday for their third straight victory. Antosz finished that game with 14 kills, nine blocks and three digs. Though volleyball coach Bob Bertucci rotated in all his players off the bench, junior middle back Jessica Antosz broke out on Homecoming, leading the Owls to their third straight victory with a three sets to one set defeat against the Rhode Island Rams last Saturday. 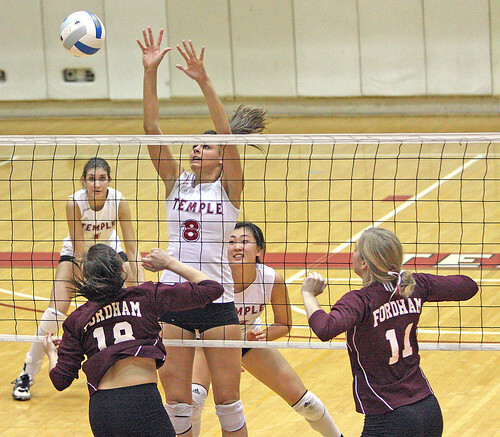 Temple (9-7, 5-2) defeated Rhode Island, 25-19, 25-11, 25-27 and 25-20 to climb to fourth place in the Atlantic Ten Conference standings. Antosz finished the match with a game-high 14 kills, nine blocks and three digs after junior outside hitter Yun Yi Zhang played a reduced role in the game after rolling her ankle earlier in the week. Zhang still recorded 10 kills, but Antosz took center stage. The senior captain had a game-high 45 assists to go with 15 digs and netted her eighth double-double of the season. Rhode Island (6-13, 1-7) did not resemble a team that dwells near the basement of the A-10 standings early in the first game. Rams sophomore Candice Kolkka tried to set up Rhode Island senior outside hitter Caitlyn Welsh early, but Temple freshman Chelsea Tupuola answered almost every time with her 17 digs. After cruising in the second game, the defense let its guard down in Set 3. Six Owls errors contributed to the lone blemish on the night. Redshirt freshman middle back Jasmine Waters played beside Zhang and junior outside hitter Jovana Radojevic up front and recorded 10 kills to add to Zhang and Radojevic’s 10 each. The 6-foot-4-inch freshman is still relatively new to the sport but has been getting experience and confidence ahead of schedule as Bertucci rotates players in and out of the lineup. Temple will face Duquesne (12-10, 2-5) and a return match with George Washington (16-7, 4-3) in next week’s road trip. Nestled between those two games is a match against No. 19 and defending A-10 champion Saint Louis (13-6, 6-1). The Owls have won just one road match this season.